I play pickleball. For those of you not familiar with perhaps the fastest growing sport in America, it’s a cross between tennis and ping-pong played on a badminton-sized court with a tennis style net that’s about a quarter of the size of a tennis court. However, this is not tennis, not even close. Unlike tennis, it’s played with a small, solid paddle and plastic whiffle ball. And, unlike tennis that typically requires reserving court time and bringing others to play, pickleball is a meet up game. That means in communities where people play, there is open court time. You don’t have to know anyone and don’t have to bring anyone. You just show up and play. It’s also incredibly addictive. Picklers like myself, will go to great lengths to rearrange their schedules to be available for those meet up times. Additionally, some people, especially retirees play every day. I would if I could, but I’m not there yet, though I do play often. My husband has started calling himself a ‘pickleball widower’. He plays a bit too, though I’m more of a pickleball addict. There are a lot of nice players in my group of neighborhood picklers. Robin takes her time returning the ball, strategically aiming for the far corners. Gary is tall, so he’s worked on perfecting his lob shot. Greg is very safety conscious, clearing leaves and debris from the court and always arrives early to squeegee away any puddles that may be left over from the rain. Then there’s Andy. Andy is a nice guy, but he hasn’t mastered the art of the game, specifically the dink. That’s a pickleball term for trying to position the ball just over the net, which can give you an advantage. Instead, Andy continually slams the ball, sometimes yelling ‘kill it’. The end result is many missed points and lost games as he hits the ball into the net or out of bounds. Andy reminds me of the guy at work who makes his own rules. Instead of focusing on a long-range goal that includes teamwork, strategy and the basics needed to maximize outcomes, he is short-sighted and focused only on the moment at hand. When you concentrate on ‘I’ and not on ‘we’, you’re setting yourself up to fail. In pickleball, advanced players will tell you to prepare for the slam by keeping your paddle up. You have no way to return a fast slam if your paddle is below the net or down by your knees. At work, you need to prepare, plan and anticipate the needs and reactions of prospects and clients or you’ll be caught off guard. In pickleball, experts will tell you instead of making the game more complex by trying to slam winning shots, keep it simple by going back to basics, such as getting it over the net. At work, it’s not that different. As your expertise expands, you will become more valuable to those around you. In sports or in business, it’s natural to focus on our selves. We want to develop skills to improve our game or get promoted at work. However, we shouldn’t do so at the expense of our teammates or co-workers. When we focus on executing shots more effectively on the court or in the boardroom, we have a better chance of hitting them where we want them to land. Comparing sports to business is hardly new. You can google endless articles, books and videos on the subject. However, the excellent examples I see inside corporate meeting rooms every day is not that different from what I used to observe when my son first played soccer. He was four years old and his team played against a girl who lived across the street. They were best friends and wanted to be on the same team but were not. She used to tell him that when she grew up she was going to marry him. (she married someone else). On this particular day as my son’s team was moving in one direction and her team was moving in another direction, their eyes met, they grabbed hands and began skipping down the field together. When you’re four, it’s cute. We can also learn from these four-year old’s, specifically what I call the three C’s. Collaboration, interaction and building relationships with the other side goes a long way. When you interact with people who are different than you, you’re exposed to new ideas, insights and opinions. This can stimulate productivity, enthusiasm and unique approaches to problem solving. Every office has a cast of characters. Some are leaders while others follow. All have different backgrounds. What’s most important is to respect their quirks and personalities. We don’t all approach issues the same way. There isn’t always a right and a wrong, but there are other ways to accomplish goals. The importance of communicating on the field or in the office can’t be understated. Communication allows colleagues to build trust, credibility and permits people to speak openly without fear of being judged. The more we communicate, the more approachable we appear. Whether playing pickleball, soccer or negotiating a deal, to do it right takes hard work, preparation and perseverance. As we know, it doesn’t always go smoothly. It’s okay to hit hard and slam it out of bounds once in a while. And, there’s nothing wrong with wanting to win. However, in order for us to score points, we have to rely on others. The post Successful Business People Do These 10 Things Best appeared first on Lolly Daskal. The business environment has never been more demanding than it is right now. Factors that would have been exceptional not long ago—global competition, turbulent markets, demanding shareholders and customers, and constantly changing technology—are an everyday fact of life. More than ever, successful organizations depend on the quality of their leadership. And successful leadership depends on broad-strokes preparation based on principles you can apply in any situation, however volatile. Be both flexible and resolute. To be an effective leader, you have to learn to balance being unbending and being adaptable. Great leaders know how to go with the flow without losing direction, moving their organization forward with resiliency and alertness. Delegate but don’t be demanding. Too many leaders feel they need to control every little thing. Allow others to do their job and do it well. When you delegate wisely and often, you’re developing leadership skills, confidence and trust within your team. Set direction but make it compelling. Every employee needs some degree of direction. Set specific and measurable goals with your employees, then regularly monitor their progress against their own goals as well as their contribution toward organizational goals. Communicate with honesty and clarity. Many leaders don’t communicate clearly enough or often enough. Make the effort to inform, report, and communicate concisely so people are free to work without information gaps. Be accessible and available. At its core, your leadership is all about your people. When someone needs you, it’s time to look up, make eye contact, set aside your work and your phone and any other distractions, and focus on the person standing in front of you. Don’t just solve problems, create lasting solutions. There will always be problems, and there will always be a need for leaders who can create timely solutions that endure. Too many leaders settle for quick fixes that often cause bigger problems down the road. Focus on healing the cause of the problem instead of treating the symptoms. Consistently recognize the achievements of others. Every employee wants to do a good job. And when they do, they want recognition from their leader. The simple act of recognizing and rewarding employees for a job well done is enough to set you apart as a leader. Lead From Within: If you want to grow into a truly effective leader, start today to cultivate these skills. Then, when the time comes, you’ll be prepared to steer your company and people in the right direction. 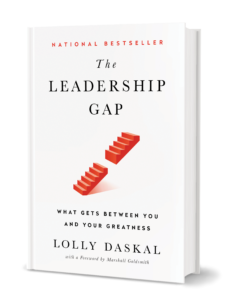 The post 7 Ways to Be a More Effective Leader appeared first on Lolly Daskal.